Demonstrate the use of the Raspberry Pi and a basic webcam, along with Motion and FFmpeg, to build low-cost dashboard video camera for your daily commute. Most of us remember the proliferation of dashboard camera videos of the February 2013 meteor racing across the skies of Russia. This rare astronomical event was captured on many Russian motorist’s dashboard cameras. Due to the dangerous driving conditions in Russia, many drivers rely on dashboard cameras for insurance and legal purposes. 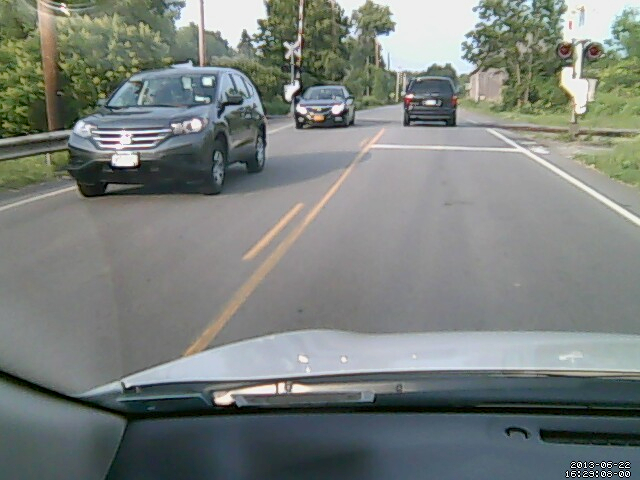 In the United States, we are more use to seeing dashboard cameras used by law-enforcement. Who hasn’t seen those thrilling police videos of car crashes, drunk drivers, and traffic stops gone wrong. Although driving in the United States is not as dangerous as in Russia, there is reason we can’t also use dashboard cameras. In case you are involved in an accident, you will have a video record of the event for your insurance company. If you witness an accident or other dangerous situation, your video may help law enforcement and other emergency responders. Maybe you just want to record a video diary of your next road trip. A wide variety of dashboard video cameras, available for civilian vehicles, can be seen on Amazon’s website. They range in price and quality from less that $50 USD to well over $300 USD or more, depending on their features. In a popular earlier post, Remote Motion-Activated Web-Based Surveillance with Raspberry Pi, I demonstrated the use of the Raspberry Pi and a webcam, along with Motion and FFmpeg, to provide low-cost web-based, remote surveillance. 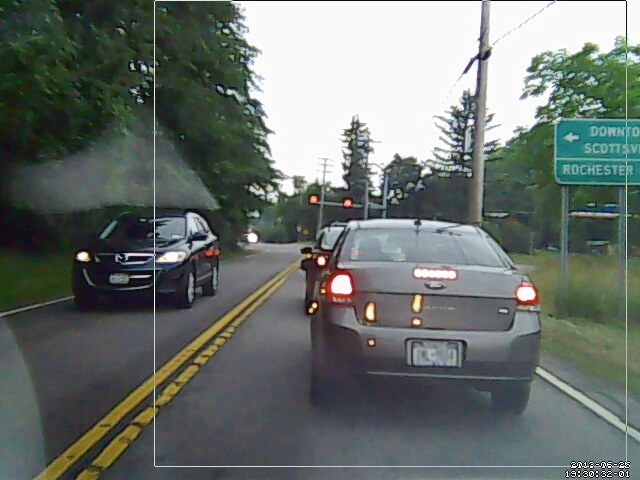 There are many other uses for this combination of hardware and software, including as a dashboard video camera. I’ve found two methods for capturing dashboard camera videos. The first and easiest method involves configuring Motion to use FFmpeg to create a video. FFmpeg creates a video from individual images (frames) taken at regular intervals while driving. The upside of the FFmpeg option, it gives you a quick ready-made video. The downside of FFmpeg option, your inability to fully control the high-level of video compression and high frame-rate (fps). This makes it hard to discern fine details when viewing the video. Alternately, you can capture individual JPEG images and combine them using FFmpeg from the command line or using third-party movie-editing tools. The advantage of combining the images yourself, you have more control over the quality and frame-rate of the video. Altering the frame-rate, alters your perception of the speed of the vehicle recording the video. The only disadvantage of combining the images yourself, you have the extra steps involved to process the images into a video. At one frame every two seconds (.5 fps), a 30 minute commute to work will generate 30 frames/minute x 30 minutes, or 900 jpeg images. At 640 x 480 pixels, depending on your jpeg compression ratio, that’s a lot of data to move around and crunch into a video. If you just want a basic record of your travels, use FFmpeg. If you want a higher-quality record of trip, maybe for a video-diary, combining the frames yourself is a better way to go. Since you will be powering on your Raspberry Pi in your vehicle, and may have no way to reach Motion from a command line, you will want Motion to start capturing video and images for you automatically at startup. To enable Motion (the motion daemon) on start-up, edit the /etc/default/motion file. Change the ‘start_motion_daemon‘ setting to ‘yes’. If you decide to stop using the Raspberry Pi for capturing video, remember to disable this option. Motion will keep generating video and images, even without a camera connected, if the daemon process is running. Although taking dashboard camera videos with your Raspberry Pi sounds easy, it presents several challenges. How will you mount your camera? How will you adjust your camera’s view? 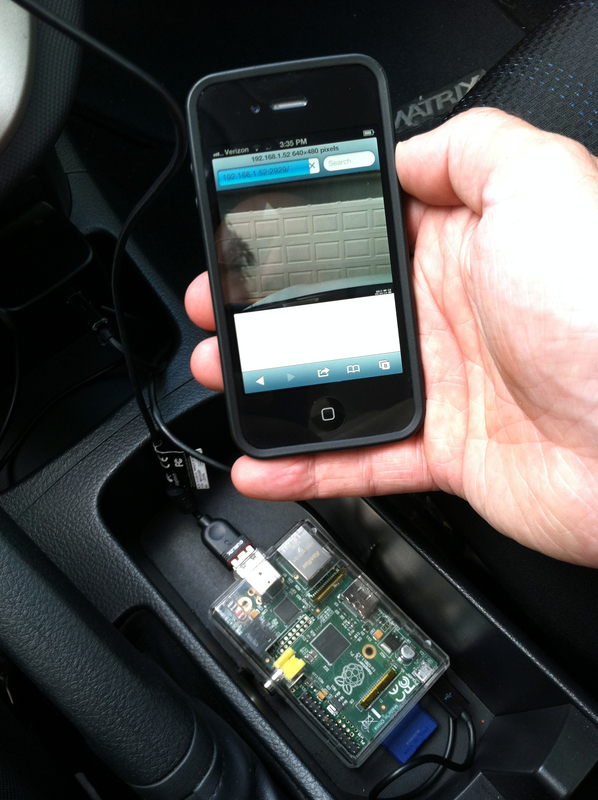 How will you power your Raspberry Pi in the vehicle? How will you power-down your Raspberry Pi from the vehicle? How will you make sure Motion is running? How will you get the video and images off the Raspberry Pi? Do you have one a mini keyboard and LCD monitor to use in your vehicle? Or, is your Raspberry Pi on your wireless network? 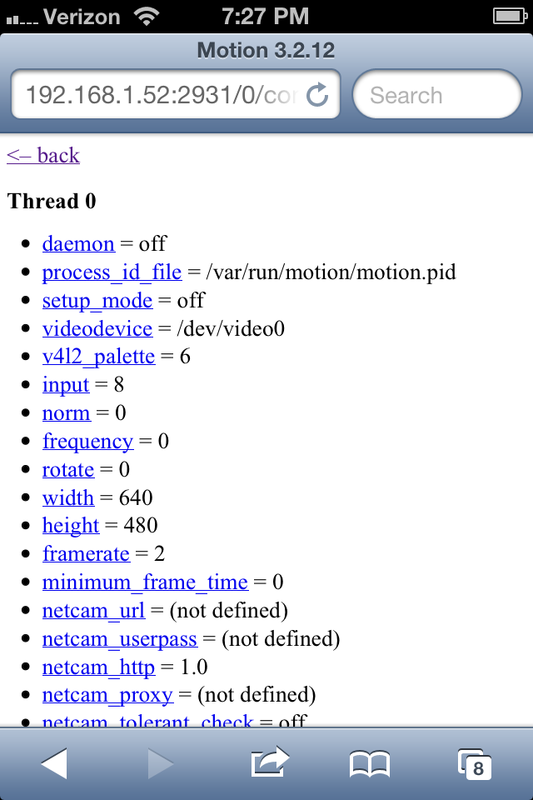 If so, do you know how to bring up the camera’s view and Motion’s admin site on your smartphone’s web-browser? Plug the webcam and the power cable into the Raspberry Pi. Let the Raspberry Pi boot up fully and allow Motion to start. This takes less than one minute. Open the http address Motion serves up using my mobile browser. (Since my Raspberry Pi has a wireless USB adapter installed and I’m still able to connect from my garage). Adjust the camera using the mobile browser view from the camera. Optionally, use Motion’s ‘HTTP Based Control’ feature to adjust any Motion configurations, on-the-fly (great option). Let the car run for at least 1-2 minutes after you stop. The Raspberry Pi is still processing the images and video. Copy the files off the Raspberry Pi over the local network, right from car (if in range of my LAN). Alternately, shut down the Raspberry Pi by using a SSH mobile app on your smartphone, or just shut the car off (this not the safest method!). Place the Pi’s SDHC card into my laptop and copy the video and/or still image frames. 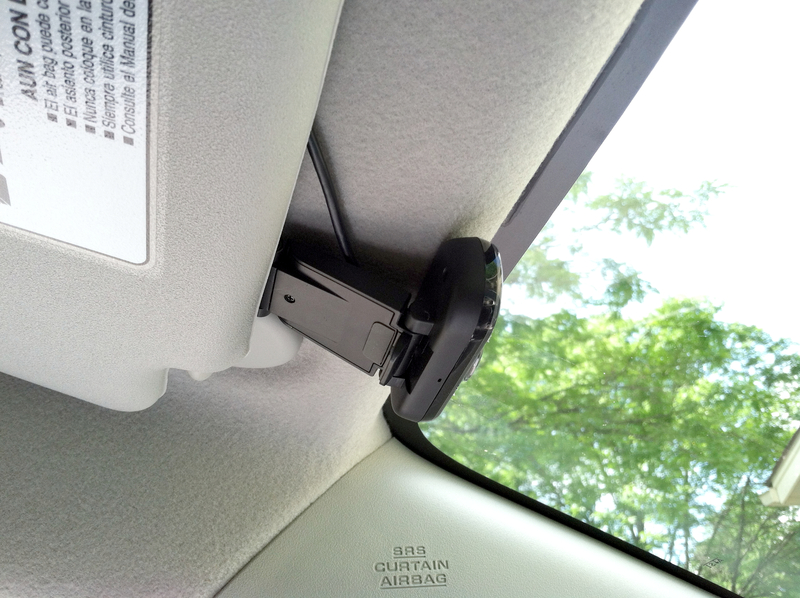 Leave your camera in your vehicle once you mount and position it. Make sure your camera is secure so the vehicle’s vibrations while driving don’t create bouncy-images or change the position of the camera field of view. Clean your vehicle’s front window, inside and out. 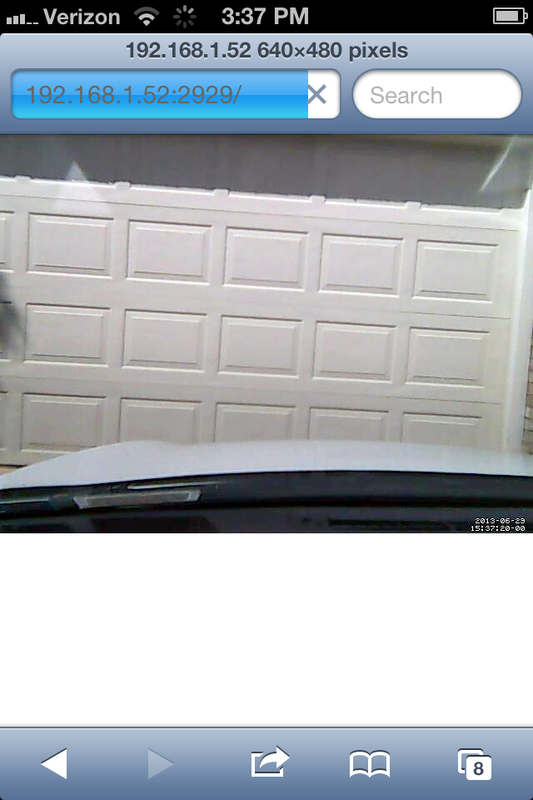 Bugs or other dirt are picked up by the camera and may affect the webcam’s focus. Likewise, film on the window from smoking or dirt will soften the details of the video and create harsh glare when driving on sunny days. Similarly, make sure your camera’s lens is clean. Keep your dashboard clear of objects such as paper, as it reflects on the window and will obscure the dashboard camera’s video. Constantly stopping your Raspberry Pi by shutting the vehicle off can potential damage the Raspberry Pi and/or corrupt the operating system. 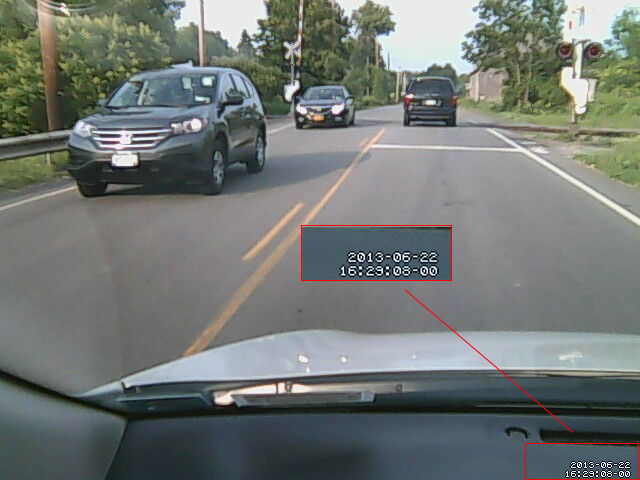 Make sure to keep your Raspberry Pi out of sight of potential thieves and the direct sun when you are not driving. Backup your Raspberry Pi’s SDHC card before using for dashboard camera, see Duplicating Your Raspberry Pi’s SDHC Card. If you choose the second method for capturing dashboard camera videos, the easiest way to combine the individual dashboard camera images is by calling FFmpeg from the command line. To create the example #3 video, shown below, I ran two commands from a Linux Terminal prompt. The first command is a bash command to rename all the images to four-digit incremented numbers (‘0001.jpg’, ‘0002.jpg’, ‘0003.jpg’, etc.). This makes it easier to execute the second command. I found this script on stackoverflow. It requires Gawk (‘sudo apt-get install gawk’). If you are unsure about running this command, make a copy of the original images in case something goes wrong. The second command is a basic FFmpeg command to combine the images into a 20 fps MPEG-4 video file. More information on running FFmpeg can be found on their website. There is a huge number of options available with FFmpeg from the command line. Running this command, FFmpeg processed 4,666 frames at 640 x 480 pixels in 233.30 seconds, outputting a 147.5 Mb MPEG-4 video file. 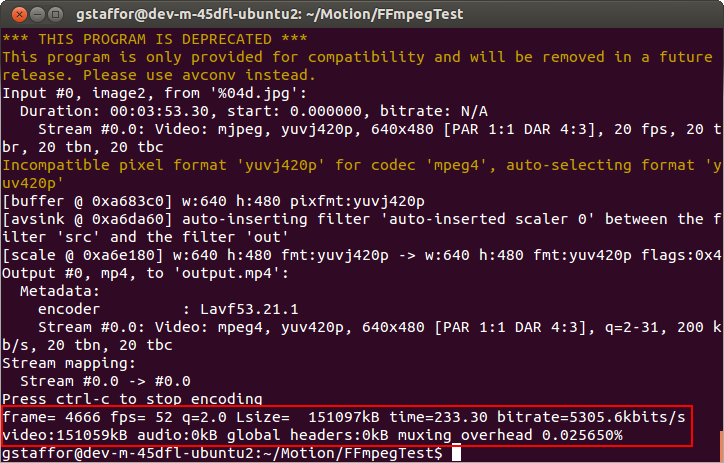 If you want to compress the video, you can chain a second FFmpeg command to the first one, similar to the one below. In my tests, this reduced the video size to 20-25% of the original uncompressed version. If your images are to dark (early morning or overcast) or have a color-cast (poor webcam or tinted-windows), you can use programs like ImageMagick to adjust all the images as a single batch. In example #5 below, I pre-processed all the images prior to making the video. With one ImageMagick command, I adjusting their levels to make them lighter and less flat. Using Windows MovieMaker was not my first choice, but I’ve had a tough time finding an equivalent Linux gui-based application. If you are going to create your own video from the still images, you need to be able to import and adjust thousands of images quickly and easily. 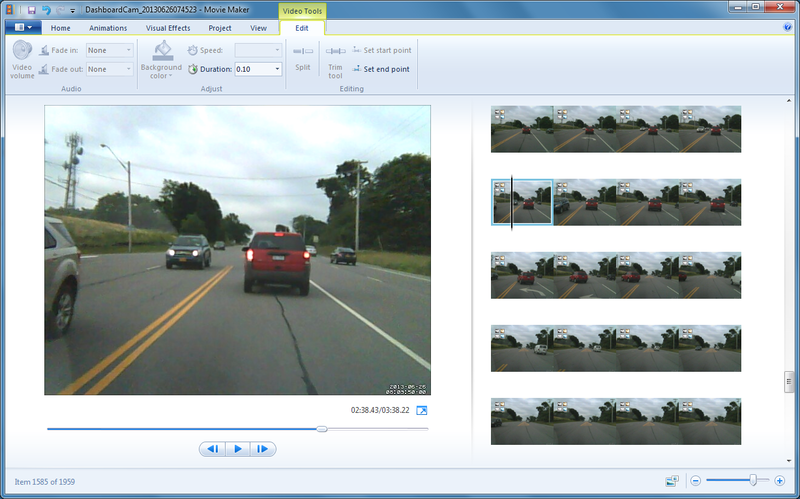 I can import, create, and export a typical video of a 30 minute trip in 10 minutes with MovieMaker. With MovieMaker, you can also add titles, special effects, and so forth. Below are a few dashboard video examples using a variety of methods. In the first two examples, I captured still images and created the FFmpeg video at the same time. You can compare quality of Method #1 to #2. This entry was posted on June 30, 2013, 11:15 pm and is filed under Bash Scripting, Raspberry Pi, Software Development. You can follow any responses to this entry through RSS 2.0. You can leave a response, or trackback from your own site. Nice work. I like it. I want to build one, but I am very new to this Raspberry pi thing. I have a Microsof t Lifecam Camera. I wanted to know how to set my Pi so that it will record to an external USB drive. I am just having problems doing the edits. I don’t see anything happening. Think you can help me out? I’m glad to see this working so well on the pi. I just recieved the cam module for the raspi today and i am not sure how to get it working with motion on debian. Maybe I will figure it out soon unless someone can help? Thanks in advance. Nice work. I like it. I want to build one, but I am very new to this Raspberry pi thing. I have a Microsoft t Life cam Camera. nice to see ur project. but i m doing same but no interface with internet, actually i want record the video with time stamp using ffmpeg but i m nt able to do that one can u help me. This is the best way to capture every motion by the raspberry – pi and to make a video complete. for storage. Any suggestion please provide make and model.